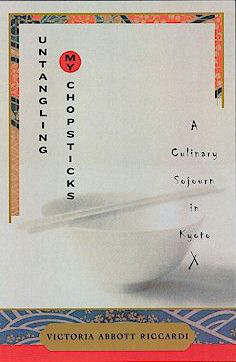 I think all of us really sunk our teeth into our current Cook the Books selection, “Untangling my Chopsticks: A Culinary Sojourn in Kyoto” and found this to be an illuminating and interesting book. The author, Victoria Abbott Riccardi, has graciously agreed to look over our posts and pick a winner for us so that the coveted Cook the Books badge will given out once more. Japanese food and culture was new to some of our readers and old hat to others, and it was certainly intriguing to read what people thought about the book and were inspired to cook up from its pages. First up is Andreas from Delta Kitchen, who is no stranger to Japanese food or culinary exploration. His chopsticks were not tangled, but locked and loaded, and he ready to cook up some serious eats based on our fabulous featured book. 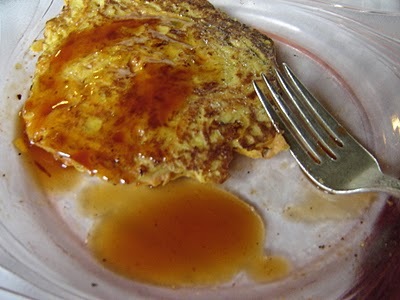 He “immensely enjoyed” his reading and was inspired to cook up some Okonomiyaki with brussels sprouts and feta. Yours truly over at The Crispy Cook found that making up a stock pot of dashi, which I used to make Shrimp and Egg Donburi was the perfect comfort food to ward off the heaps of snow and cold winds outside my upstate New York kitchen. 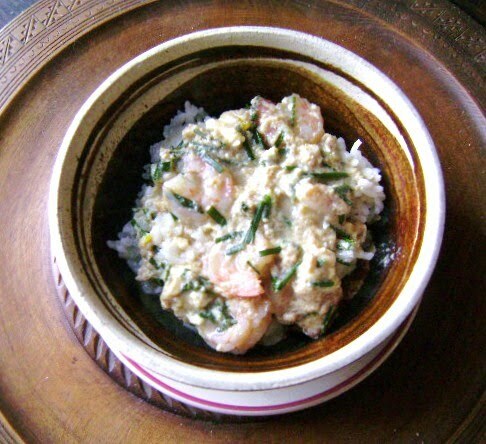 Donburi is an easy to make one-dish meal in which a mound of rice is covered with an eggy, sweet and salty broth, studded with shrimp in my rendition. Glennis of Can’t Believe We Ate was terrifically inspired by our current book selection and prepared an incredible four-course Japanese Feast for her New Year’s meal. She made everything from miso soup to sashimi to chicken yakitori. And don’t miss her photograph of her tangled chopsticks! 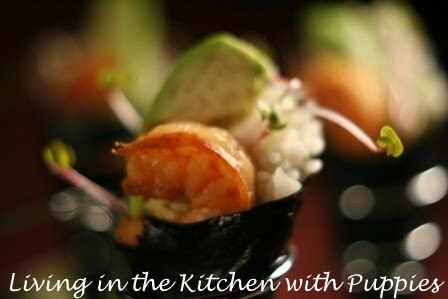 Natashya the hard-working Canadian blogger diva at Living in Kitchen with Puppies tried her hand at the difficult, but delicious-looking Temaki-Zushi. 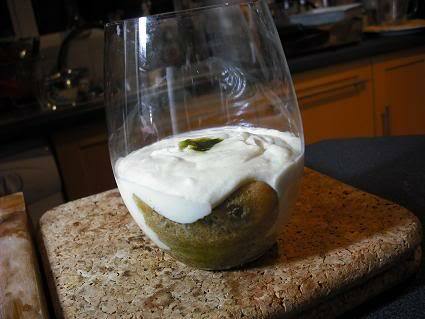 A culinary success! Ever the culinary adventuress, Foodycat enjoyed rereading this book, especially the passages in which our author prepared to greet The New Year with special ceremonies and foods. 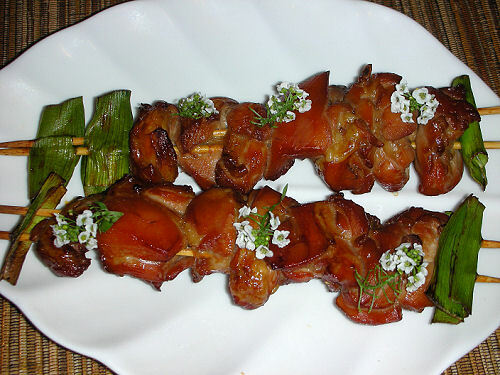 It was then as now The Year of the Rabbit, as Foodycat cleverly notes, and to greet 2011 she made her lucky husband a terrific Japanese meal that included ika geso age (crispy squid), beef and spring onion negamaki rolls, nasu dengaku (broiled eggplant), and a green tea tiramisu. Claudia, of Honey From Rock, enjoyed our book and shared some memories of two visits she has made to Japan, one to study Japanese pottery and another where she partook in a traditional tea ceremony. 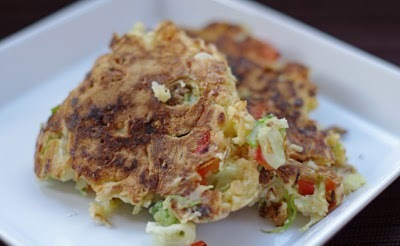 Claudia tackled Okonomiyaki, which she describes as a cross between an omelet and a pancake. 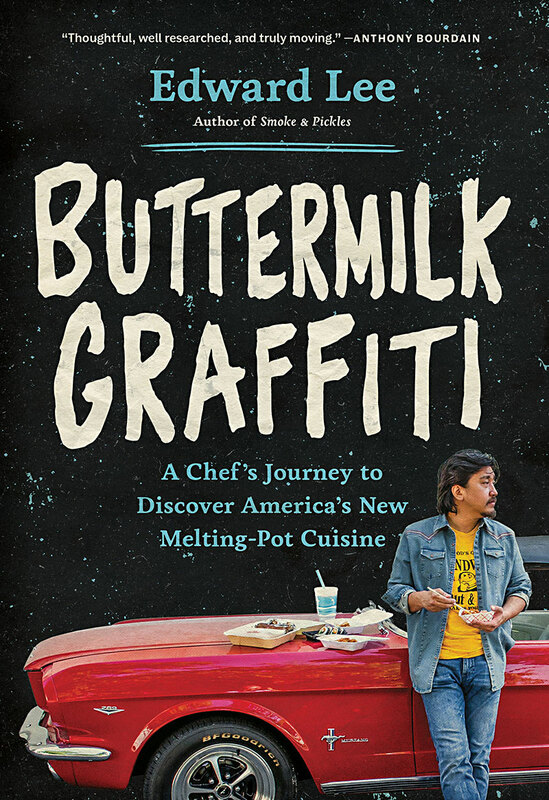 My wonderful Cook the Books co-host, Deb of Kahakai Kitchen, enjoyed re-reading this “well-written memoir for foodies and those with an interest in International travel and culture”. Her post, like Claudia’s, includes fond remembrances of her own travels in Japan. 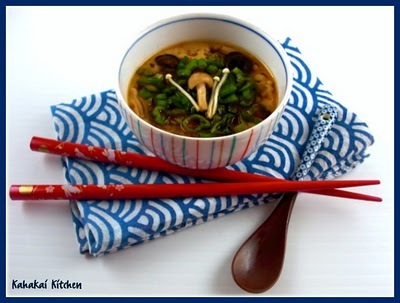 Deb’s post has lovely photos and detailed instructions for making Kinoko no Chawan Mushi, or Steamed Egg Custards with Mushrooms. 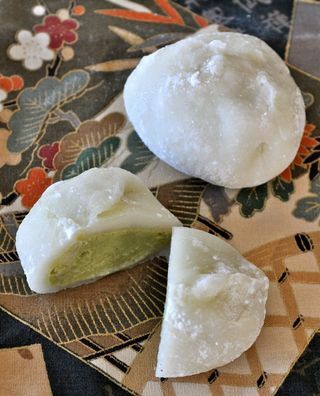 While Italian food is at the core of Simona’s blog Briciole, her lovely food essay about “Untangling My Chopsticks” showed her culinary versatility in tackling the making of green tea or matcha, and using it to make a beautiful green tea ice cream, which she later used to fashion some elegant little daifuku mochi (stuffed mochi balls). 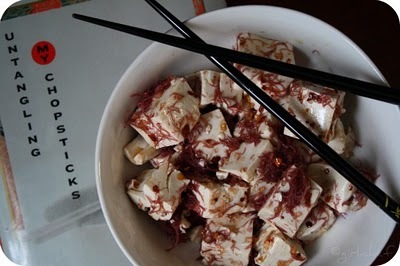 Heather the Girlichef was inspired by the tea kaiseki descriptions in our featured book and wanted to make something subtle and starkly beautiful and she captured these things in her dish, Tofu Poke, using the gift of some dried ogo seaweed. Finally, my other Cook the Books hostess, Johanna of Food Junkie, Not Junk Food, based in Athens, Greece, loved the book and loves the minimalist aesthetics of Japanese culture. 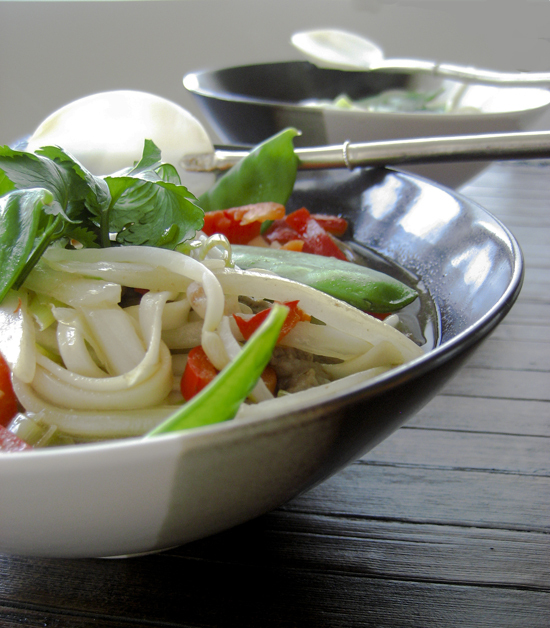 She made up a gorgeous pot of Wagamama Style Noodle Soup. Our guest judge and author, Victoria Abbott Riccardi, has agreed to look over our posts and select a winner so stay tuned to see who will win the coveted Cook the Books winners badge this go round. In the meantime, you can get started on tracking down a copy of our next Cook the Books selection, An Embarrassment of Mangoes: A Caribbean Interlude” which the lovely Deb of Kahakai Kitchen will be presiding over.